Been trying to carve out some time to assess 2016. It’s when I gather up my calendar’s, journals and notebooks to look back on my year- what I’ve learned, accomplished, tested, and where I’ve been. Surfs Up, Digital print of hand colored photograph. Admittedly, I’ve often been about, what I’ve achieved (that darn over achiever in me!). However, over the years and surely- Post 2011 (our family year of life changing challenges) I prioritize health and family and choose to do the work I do in my studio and in my community because I truly love what I do. Making art is how I make sense of the world. I discover new ways of looking at experiences and mapping out my internal landscape. This personal approach to my work connects me to nature, to others, and ultimately my Higher Self- or Higher Power. Feel free to choose your own word there- God, Love, etc. Taking this passion out in the world in workshops, classes, exhibitions, or jobs is where I find my need to relate, heal and serve. 2016 has taken a bad rap- and for good reason. Personally however, I am grateful for the blessings in my life, and there are many. I am love, I am loved, and I am loving. and that my friends, is enough. Yes Evelyn, reconnecting with you in person in Richmond, sharing some great deli was wonderful. To this day I still do yoga nidra to your wonderful voice and had Nate do it with me as well just last week. Love to you and happy and healthy new year! Happy, Healthy, Inspired New Year to you Bobbi, may you continue to be surrounded by your family of both family and friends! While the past is gone, it contains many happy memories to carry along to the future. So, here’s to 2017 and the new joys and adventures it will contain. Personally, we will dance 2016 away and 2017 in among friends and to our favorite band. Then we will bid our family goodbye and send them back to Algeria on January first. 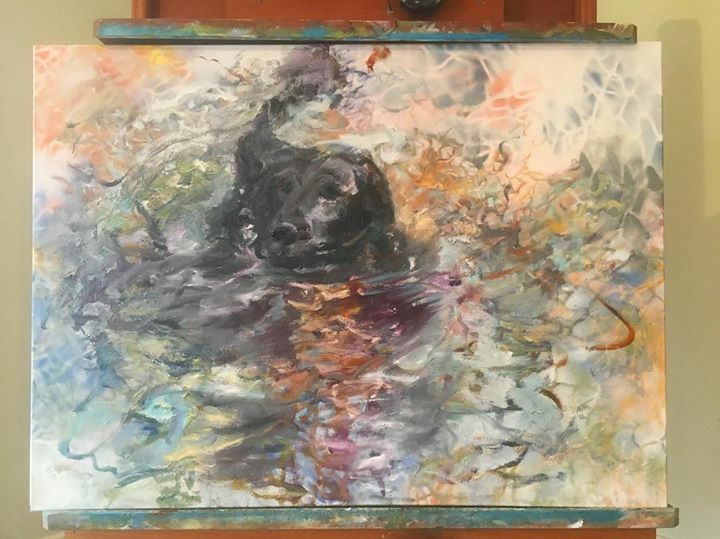 It always makes me content to think of our fish among yours, nestled down for a long winter nap in your beautiful pond, just waiting for spring to come alive again. Thank you Linda, Tom and you as well. Here’s to 2017 and safe travels on your continued adventures. And yes, all our fish are nestled together awaiting spring. Happy, Healthy and Inspired 2017 to you! Just back from a wonderful trip to Mexico(Chihuahua & Sonoran Desert areas) never been their before, so interesting! 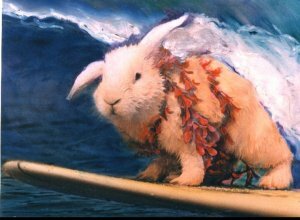 When I opened your email I saw the Aloha Bunny and remember her from our wonderful days in Hawaii….brought a real smile to my face. So happy to hear that you are happy and healthy! Lots of love and Happy 2017! Sounds like a wonderful adventure Cathy! Here’s to the new year, creative endeavors in the studio and out in the world!